Cooler Master’s new hybrid closed-loop coolers aims to fix the one weakness of CLCs—they can never drop below the ambient room temperature. That’s because closed-loop coolers rely on a series of pumps, radiators, and hoses to lower the temperature. Cooler Master’s new hybrid cooler helps break that barrier by integrating a thermoelectric cooler (or TEC cooler) into a standard CLC. Thermoelectric coolers rely on the Peltier effect to lower temperatures. TECs are commonly found in those little six-pack mini-fridges that keep your soda chilled. Cooler Master’s approach doesn’t apply the TEC directly to the CPU. Instead, it cools the liquid inside of a more conventional CLC cooler. It appears to work though. On the demo unit at Computex, we measured the CLC at 64 degrees, compared to an ambient room temperature about 15 degrees hotter. 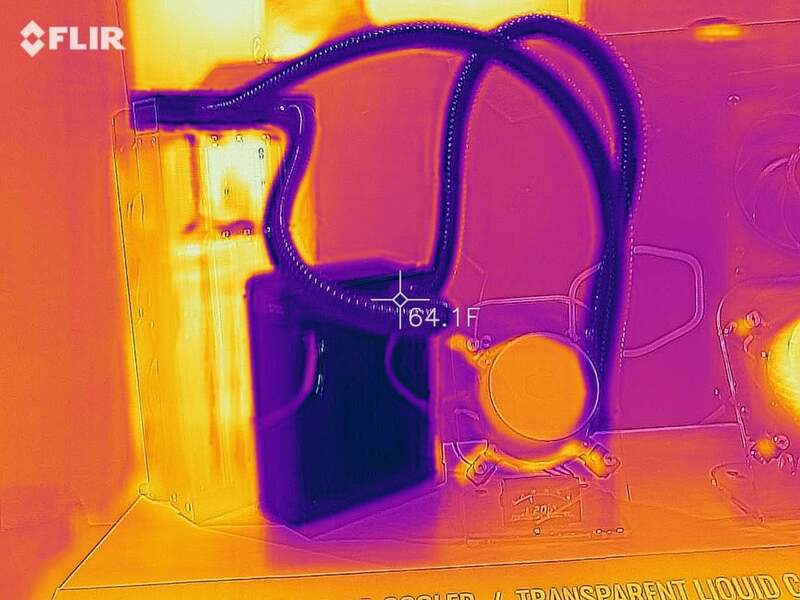 You can see how the Cooler Master works in this thermal image we snapped. Dark colors represent cooler temperatures. In a 75 degree room, the new Coolermaster CLC actuallly runs at a lower temperature thanks to the integrated TEC. Cooler Master officials told us it expects to offer about 300 watt TDP of cooling. A typical 240mm CLC might hit 180W. The main problems with thermoelectric cooling are condensation and higher power consumption needs. In Cooler Master’s case, condensation isn’t a huge issue as there’s no direct contact between the CPU and the TEC unit. Power consumption, however, won’t be low. Officials tell us you’ll need about 150W from your power supply to drive it. The thermoelectric concept isn’t new. In fact, it’s been around since the Pentium II days. And Cooler Master’s hybrid cooler reminds us a little about CoolIT’s Eliminator cooler, which also used a TEC/liquid cooler combo. 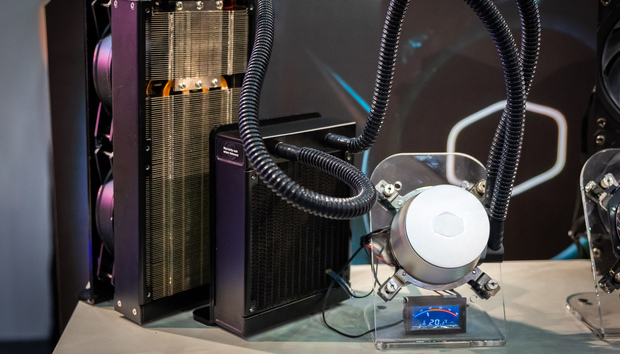 Cooler Master’s thermoelectric hybrid coolert should be available in the third quarter. No price has been set but the company expects it to competitive.